Hard water is water that contains high levels of dissolved minerals, mainly calcium (Ca) and to a lesser extent magnesium (Mg). As rainwater trickles over soft rocks like chalk and limestone, some of the minerals in the rocks become dissolved in the water,	making it "hard". Hard rocks, like granite, do not easily dissolve in water and so areas where there are hard rocks, like Scotland and the South West of England, have soft water. Water hardness is measured by the amount of hardness minerals, calcium (Ca) and magnesium (Mg), dissolved in the water. The more dissolved minerals, the harder the water. In the UK, water hardness is normally expressed as milligrams per litre of calcium carbonate equivalent (mg/l of CaCO3). Calcium carbonate equivalent is an expression of the total amount of calcium, magnesium and other minor hardness minerals in a given volume of water. Other measurements of water hardness include, degrees of general hardness (dGH), German degrees (°dH), English degrees (°e), French degrees (°F), Clark degrees (°Clark), parts per million (ppm) and grains per gallon (gpg). And these various measurements are indicative of either the amount of calcium carbonate equivalent (CaCO3), the amount of calcium oxide (CaO), or the amount of calcium (Ca2+) in a given volume of water. Table 1: Water Hardness as expressed by the amount of calcium carbonate equivalent in one litre of water. Sixty percent of the homes in the UK have hard water. To see if you live in a hard water area, check our map below or do a simple soap test. To do the soap test, get an empty 500ml bottle, quarter fill the bottle with tap water, add ten drops of washing liquid, tighten the lid and shake. If the bottle fills with suds, you don’t have a hard	water problem. Alternatively, look for white flakes of limescale in the bottom of you kettle – a sure sign of hard water. What are the consequences of having hard water? When hard water is heated above 61°C, or is left to evaporate, the dissolved hardness minerals precipitate out of the water and form limescale. Limescale clogs pipes and showerheads, reduces the efficiency of heating elements, leaves an unsightly build-up of white scale in kettles and on taps, and leaves streaks on dishes, cutlery and glasses. Hard water also makes soap difficult to lather and leaves scum deposits in sinks, basins and baths. Whilst hard water is bad for plumbing systems and kitchen appliances, there’s no evidence to suggest that it’s bad for your health. On the contrary, there are some suggestions that people who live in hard water areas have less incidences of cardiovascular disease. Calcium and magnesium in hard water may also contribute to ones dietary mineral requirements. Yes, a water softener or filter jug can soften hard water as can phosphate scale inhibitors and filter taps with a carbon resin filter. There are also a number of devices which, although they do not soften hard water, will give hard water some of the properties of soft water so that it doesn’t produce hard limescale. A Dyna Pipe Water Descaler is such a device. Hard water is water that contains high levels of dissolved minerals, principally calcium and or magnesium ions. 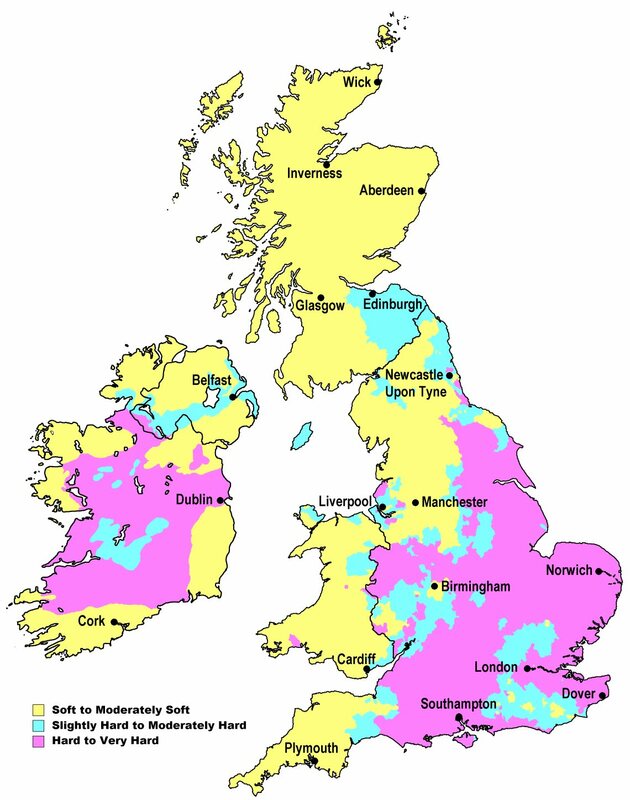 60% of homes in the UK are located in hard water areas. Limescale forms when the hardness minerals precipitate out of hard water. 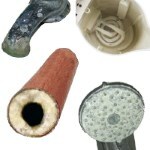 Limescale clogs pipes, reduces the efficiency of heating elements and leaves white deposits on tiles, baths and basins. Scale that forms on showerheads, taps and bathroom surfaces is caused by evaporation, not precipitation. Soap doesn't produce a good lather with hard water. Hair is duller and harder to maintain when washed in hard water. Although calcium is an essential part of a healthy diet, the calcium carbonate in hard water is much more difficult to absorb than the calcium in food products. People who live in hard water areas have less incidences of heart disease. Guinness is brewed using hard water. Note: The top 10 lists of hard water areas shown here, are based on sales of Dyna Pipe Water Descalers, not actual water hardness.